Argentina had a highly developed economy and a most advantageous natural resource base. It was an economic powerhouse during World War II, benefitting from world demand for its products. But Argentina's economy was, of course, subject to it politics. From 1946 to 1952, President Juan Peron and his wife Eva made populist appeals to the passions of Argentina's "fed up" poor and working classes. The Perons aimed at giving the poor working masses the good life that was enjoyed by those with wealth. The poor and workers wanted more. And the Perons defined the "two arms" of their politics as "social justice and love" for "the people." The Perons were not hardheaded in apprehending long range macroeconomic realities. One might say that they were strong on opportunism and not so strong in fathoming ideas derived from the study of economics – Marxist, Keynesian or Conservative. Time Magazine (July 5, 1982) writes of Peron having "poured resources into highly protected, inefficient, state-directed enterprises," and as having "depleted Argentina's treasury as the country devoured its foreign exchange earnings from agriculture." Philip Jenkins, in The American Conservative (Feb 9, 2009) adds that under the Perons "the bureaucracy swelled" and that the Perons "bought loyalty through a massive program of social spending while fostering the growth of labor unions." Jenkins writes that Argentina came to be "the most unionized nation in Latin America." And he writes that "high taxes and economic mismanagement took their toll." 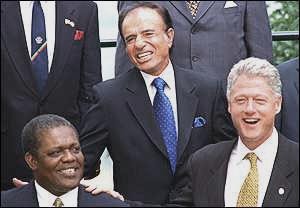 Presidents Menem and Clinton share a laugh during the 1994 Summit of the Americas. Menem doesn't look as happy, with good reason. His country's economy was in deeper trouble. According to Jenkins, the military governments that followed Juan Peron in power "borrowed enormously with no serious thought about consequences... Foreign debt exploded, the deficit boomed, and inflation approached 100 percent a year." In 1982, the military junta tried to appeal to the masses by a great patriotic fight against Britain over the Falkland (Malvinas) Islands. The appeal to patriotism fired up the emotions of the masses, but the war contributed to Argentina's economic difficulties. Britain won the Falklands war and Argentina's military rulers were replaced by civilian rule and some democracy. The International Monetary Fund lent the new government money with which to stabilize its economy, and the new government, under, Raúl Alfonsín, created an economic plan to do just that. To fight inflation, Alfonsin tried price controls, which were negotiated with fifty-three leading companies. And Alfonsín froze the wages of state workers and negotiated with labor unions. But it didn't work, and Alfonsin's government was unable to pay the interest on the government's debt. The cycle of rising prices and wages to meet those prices spiraled out of control. In one month, July 1989, Argentina's inflation was 200 percent. This disaster was accompanied by capital flight and investor confidence. Middle-class savings were annihilated, and a loss had accrued to working people in the form of real wages (what money could buy). Wages had not kept up with prices. The prices of goods in stores and supermarkets were updated several times in the same day, accompanied by a rush to buy. A shortage of basic goods in the stores developed. In that month of July, 1989, demonstrations erupted accompanied by riots and looting. Carlos Menem, the winner of a presidential election and scheduled to take power in December, was given power ahead of schedule in July. Menem was president for ten years and five months. There was a new wave of riots in February and March, 1990, but the riots were contained quickly, as before, with the delivery of food assistance to the poorer neighborhoods. The Menem administration pegged the value of Argentina's currency to the dollar. And it privatized the state's oil company, the post office and the telephone, electric and water utilities. This impressed some people, and optimistic investors poured their capital into Argentina's economy, which helped lower inflation to single digits by 1993. A lot of workers were laid off with an improvement in productivity. The International Monetary Fund (IMF) kept lending money to Argentina and postponing its payment schedules. Menem's policies were not drastic enough. The government was not taking in enough revenue, with the wealthy exercising their game of tax evasion, and people were still sending their excess money to foreign banks rather than investing it in Argentina or helping to pay down government debt. Eventually, optimism waned and the influx of money from foreign investors dried up. The optimism was not justified. There was a diminished competitiveness in selling goods abroad, and fiscal deficits were on-going. The problem was still debt and confidence in Argentina's currency. On December 1, the government moved to prevent a flight of money from banks, intending to stop the draining of deposits that had been taking place through the year. The government put limits on withdrawals and how much could be transferred abroad. People could still use their money via credit cards, checks and other forms of non-cash payments, but the new restrictions created delays and problems for the general public and businesses. Long lines began forming at every bank. In mid-December the official rate of unemployment was announced as having risen to 18.3 percent in October. Fed up labor unions called a nationwide strike. Demonstrations, looting and violence mounted across Argentina's major cities. There was also the "pot banging" said to be a sign of the middle-class joining in the unrest. De la Rúa declared a "state of siege" throughout the country and called on the Peronists, thought to be involved in the protests, to join in a government of national unity. The violence increased, and President De la Rúa tried to impose censorship on all news outlets from the capital, Buenos Aires. The idea was to use the state of siege to force the television networks to stop transmitting current events and broadcast emergency programming. Protesters converging on the president's residence ended with De la Rúa's "escape" by helicopter, broadcast throughout the country. With this disgrace, on December 21, De la Rua resigned. In the next year he was followed by three presidents. In 2002, inflation and unemployment worsened. Many businesses shut down or went bankrupt. The economy was in recession, many imported products became virtually inaccessible. With all of the support that had been given to the Peronist supporting workers across the decades, they and others had gained little. Real wages by 2002 were at their lowest point in six decades. Argentina's currency, originally pegged at 1 to 1 against the U.S. dollar, was in 2002 at 4 to 1. At least there was money. Always during hard times there was an underground economy. The big losers were the creditors – those whom the government owed money. Argentina had defaulted on its loans. It was the largest such default in modern world history. With the prospect of more borrowing at an end and many Argentines unable to buy imported goods, a recovery began in 2003. A favorable balance of trade had arisen. More money was coming into the country than leaving it. Argentines were either bringing their money home from abroad or getting it from under their mattresses. Workers took over a few factories abandoned by the owners, to "restart the silent machines" – these "worker-cooperatives" later to be contested by former owners. Although creditors had been abandoned, some foreign investors were attracted by economic growth – the source of profits. New investments trickled in from abroad. And during the next five years the economy grew 9 percent annually. Meanwhile it was said in government circles that eventually the debt question would have to be settled in order to attract more foreign capital, for the sake of further, or maximized, economic growth. In 2010, the Argentine government would be negotiating with its former creditors, trying to settle for a fraction of its original debt in order to start anew in the world of borrowing and investment.